Welcome to the Gifted Gorgeousness SAL! Or GG or even GiGi depending on who you are! 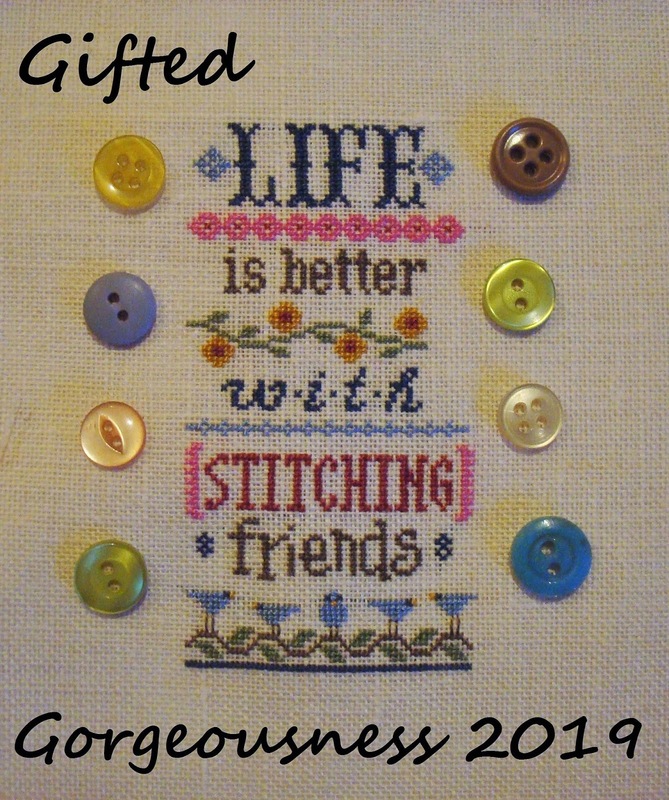 I started this SAL in 2015 because I was sure we had all benefited from the generosity of our fellow bloggers and needed a chance to show our appreciation for that generousness by doing what we do best - stitching and blogging about it! Q: What is eligible for the Gifted Gorgeousness SAL? Anything else you can somehow shoehorn with word "gift" into! Q: When do we post? A: On the 15th of each month. Because (a) there are plenty of end of months SALs already and (b) that's what we did in the first year. Q: What if I miss a month because I'm busy or don't stitch anything gifted that month? Q: Is there a doodah to go on the sidebar of my blog? A: Yes! See at the bottom of this page. Just save it to your desktop and insert as an image into your sidebar using the Gadgets in the Layout part of your blog dashboard. Full instructions available by request. Q: I have a question not already covered. A: Just leave a comment and I will get back to you. NB if you are a "no reply" person, the answer will be on here. Q: How do I join in? I'm in.... and yes I know that 2018 was a dismal failure when it comes to blog posting but I am going to try so much harder in 2019!! I'm back again!! I enjoy this Challenge so much, it keeps me on my toes, especially since I've made a lot of personal challenges for myself this year. Let's hope it's a productive one! Thanks for hosting, Jo! Wohoo! Thanks for hosting again!! I've got a ton of gifted projects ~ so I will be happily stitching along! 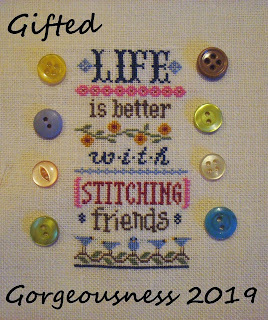 Looking forward to another year of stitching and seeing what everyone else has done. Thank you Jo for another year of GG - I know how much time this and the Blog Hops take and I really appreciate what you do for Blogland, I'd love to join in for 2019, thank you. Looking forward to another year of Gifted Gorgeousness. Looking forward to another year of Gifted Gorgeousness! Thank you Jo for organising us, I really appreciate your organisational skills and hope I can join in again, for most of the year! I participated last year for the first time and I loved it. I was really looking forward to repeat.